What do Llamas Eat and How Long Can a Llama Go Without Water? Llamas are not too picky about their food and will eat hay, grass, and grain. Domesticated Llamas are usually fed a mixture of bromgrass hay, alfalfa hay and corn silage, and a llama owner has a wide variety of commercial and farm based food products to choose from. Young llamas, which are still growing, require a more nutrients than adult llamas because they have smaller digestive systems. Unlike the camel, which is very water efficient, the llama has to drink water every day. It can go without food for a while, but the llama is a mountainous creature, not built for hot, arid places. Llamas and Liquids go together like a horse and carriage. What is the Difference Between Llama and Lama and Do Llamas Live in Tibet? Why do Llamas Spit When Threatened and How do you Tell When a Llama is About To Spit At You? 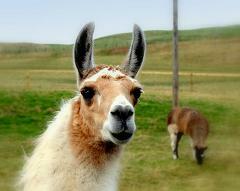 How Much does it Cost to Lease a Llama and What are Domesticated Llamas Used for?